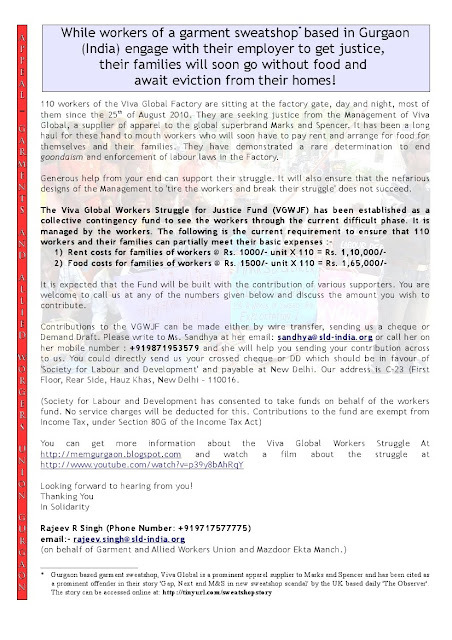 The Viva Global Workers Struggle for Justice Fund (VGWJF). A HUGE THANK YOU to all those who have responded to the appeals for the Viva Global Workers' Struggle Fund. We have collected a little less than half our target goal for the families. We disbursed the amount yesterday. Workers in the 24-hr protest site, are strengthen and motivated by the fact that their protest has garnered them supporters from all over the world!! We are now trying to collect the other half of our target. For those, who may have missed my appeal -- please donate to the fund to help families of workers in this historic struggle. This has the potential to culturally change this export hub. No donation is too little! !